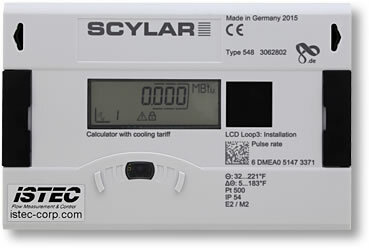 Scylar Model 5202S Energy Meter is designed for use in heating systems, cooling systems, and heating/cooling systems. This highly accurate energy calculator records all data needed to sub-meter from small apartments to large district heating/cooling applications. Pulse Output Module with 2 Open Collector pulse outputs (potential-free), output 1: 4 Hz (pulse width 125 ms), pulse or static conditions (e.g. errors), output 2: 100 Hz (pulse width ≥ 5 ms), ratio: pulse duration / pulse break ~ 1:1, configurable via IZAR@SET software. Pulse Input Module with 2 pulse inputs, max. 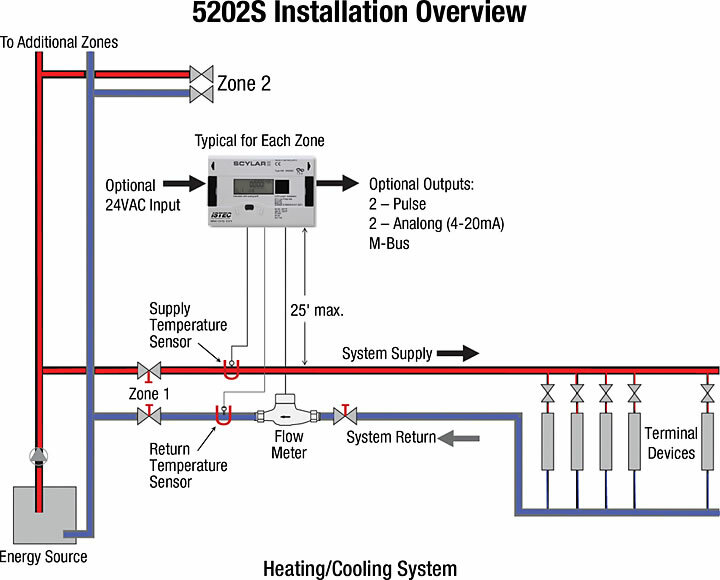 20 Hz, configurable via IZAR@SET software, data can be transferred remotely. Combined Pulse Input/Output Module with 2 pulse inputs and 1 pulse output, configurable via IZAR@SET software, needed for leak detection. Analog Output Module for 4-20 mA with 2 programmable passive outputs, programmable value in case of error.